The piece was composed in 1996 as a commission composition for the Gitarrenensmble Rheine. It was inspired by a painting by the expressionist painter Edvard Munch, on which he portrays his ambivalent relationship with his belovedTula Larson. She is displayed three times in the foreground of the painting. Each time with a different expression and a diffent colored dress. Wüller also used contrasting expressions in his musical implementation. The piece begins in a spherical rhythmic soundworld, but then, after an interplay with whole- and semitone-scales, the music culminates into the main theme with an initial almost naïve tonality. 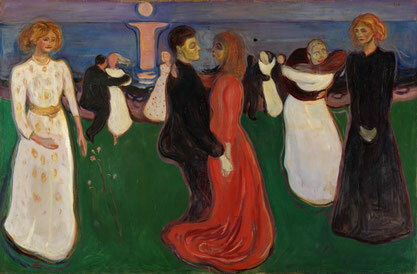 But just after three bars into this theme the rhythmic and harmonic structure is disturbed and a feeling of inner unrest evolves, which is so characteristic for the painting by E. Munch as for this piece. In the further course of the piece, this constricting mood grows in ever more dramatic ways and finally leads to the loss of all structures. Rhythm, melody, and dance character are lost. All movement is frozen into a motionless ostinato of the bass-guitar with its "dropped D" tuning. The life cycle ends. The piece requires at least 11 players: four guitar parts (each doubled), a bass guitar and two octave guitars.